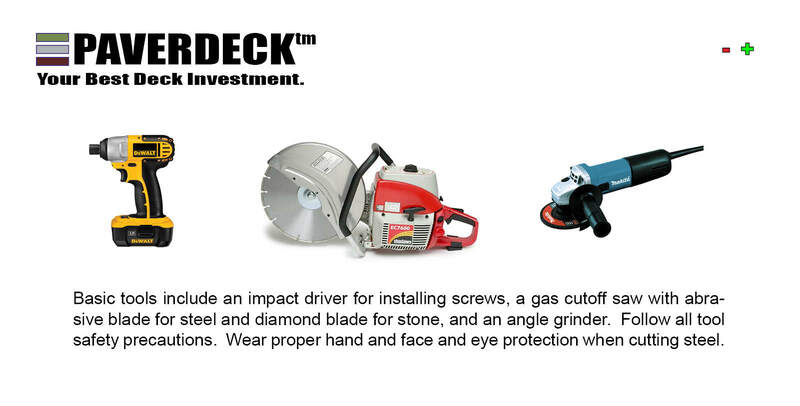 Upgrade your deck to a long-life low/no maintenance deck. 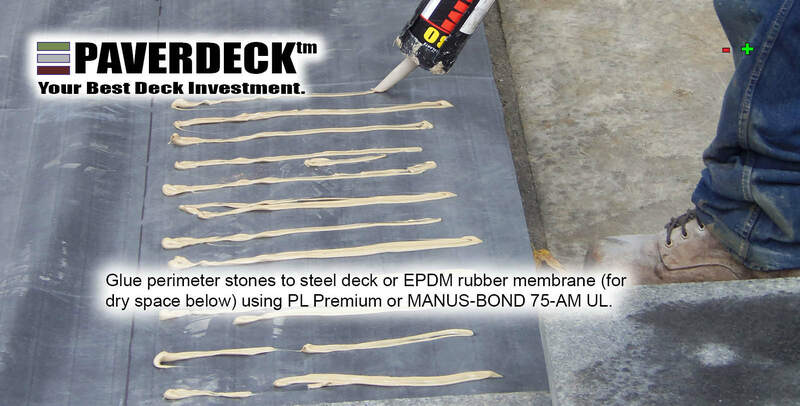 Choose the longest lasting maintenance free decking structure. 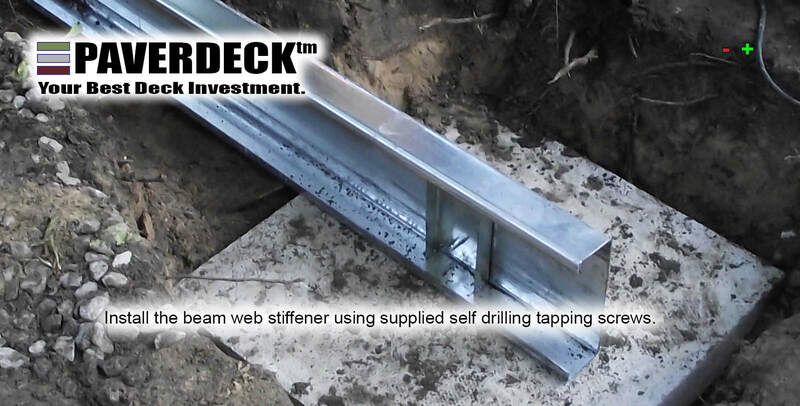 PAVERDECK™ for those who want to build a new deck using a complete steel structure on new footings. 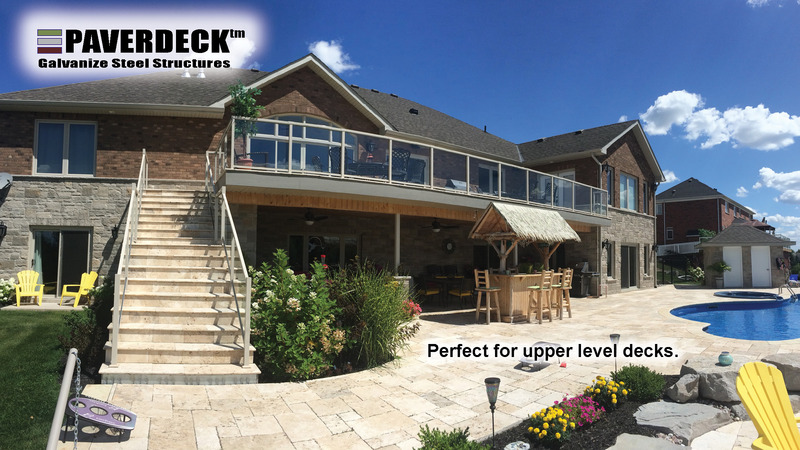 TILEDECK™ for those who want to upgrade my existing wood deck structure to increase its lifespan, on its existing footings, and finish with an outdoor porcelain tile. 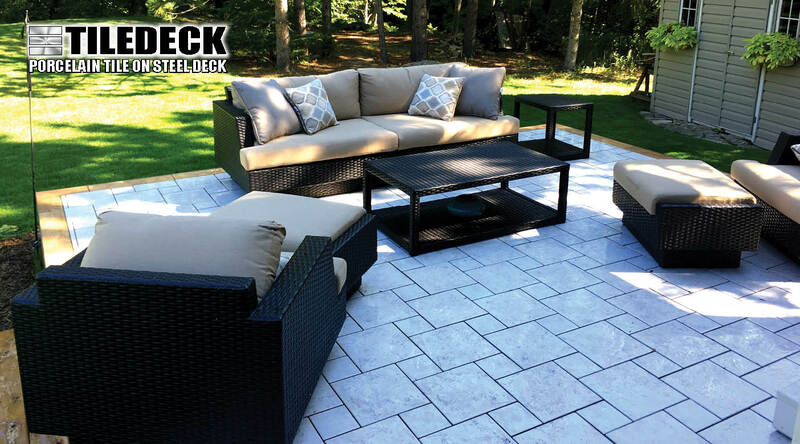 TILEDECK™ for those who want to build a new deck using a treated wood structure on new footings, and finish it with stone/concrete pavers or outdoor porcelain tile. 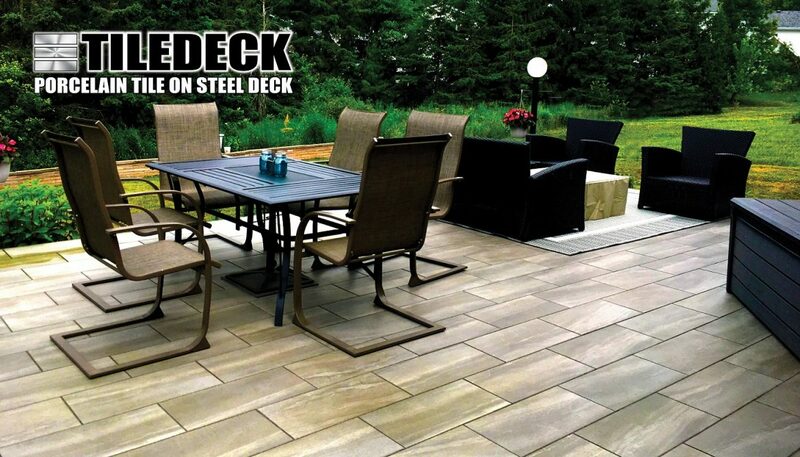 Stone/concrete pavers or porcelain tile are the most enduring materials on the planet – and when combined with our galvanized steel system – its the the last deck you’ll ever need to build. 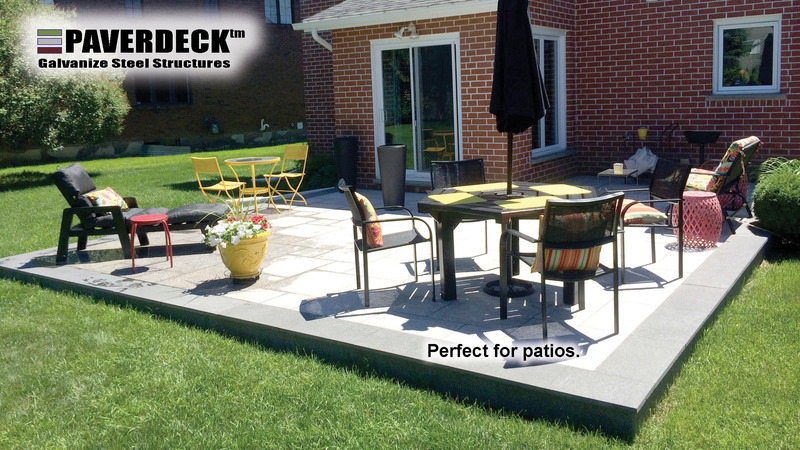 Our customers choose the SPX structure because they want a lifelong structure to realize their investment in an outdoor living space. History has shown us that steel and stone are lasting materials able to survive exposure to the sun and weather. It only makes sense to combine them in creating a lasting outdoor living space. 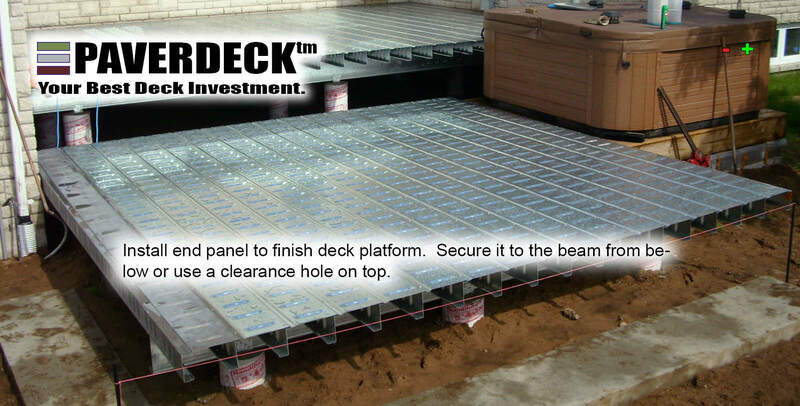 As a result, SPX is the only deck structure certified by Underwriter’s Laboratory for USA and Canada. You want the longest lasting maintenance free decking structure that does not require the regular maintenance of a wood deck. 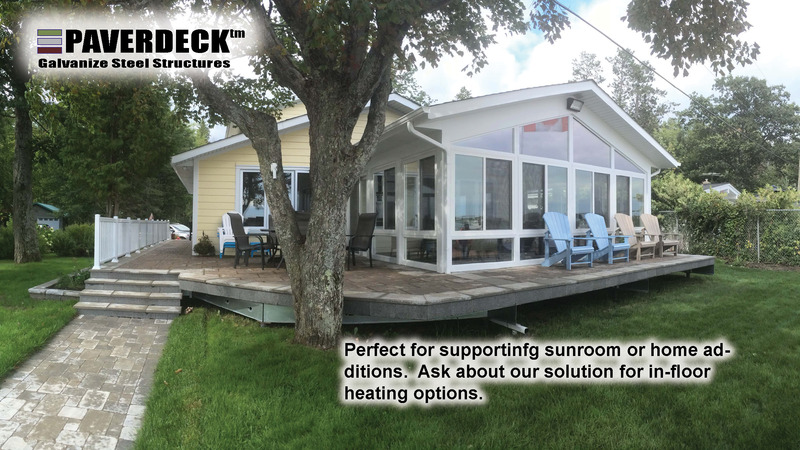 You want the confidence that your treated wood structure and decking finish will withstand the effects of the sun and weather longer than a traditional deck. 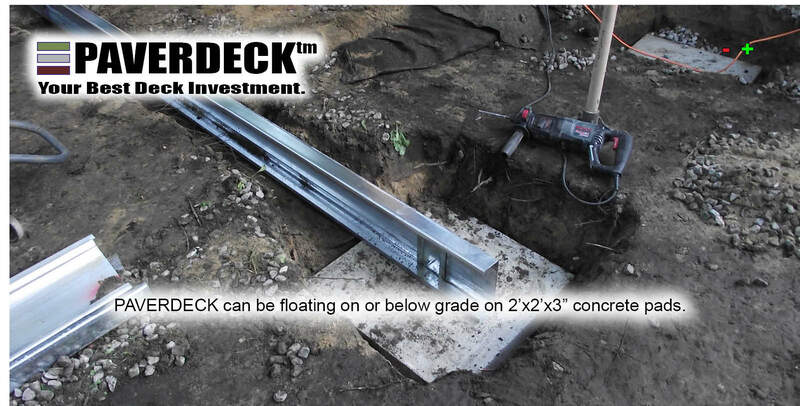 Since TILEDECK™ can support economical standard porcelain tiles on standard footings/foundation, the cost of this option is similar to composite decking. Porcelain tiles are readily available in a range of styles and can fit any budget. 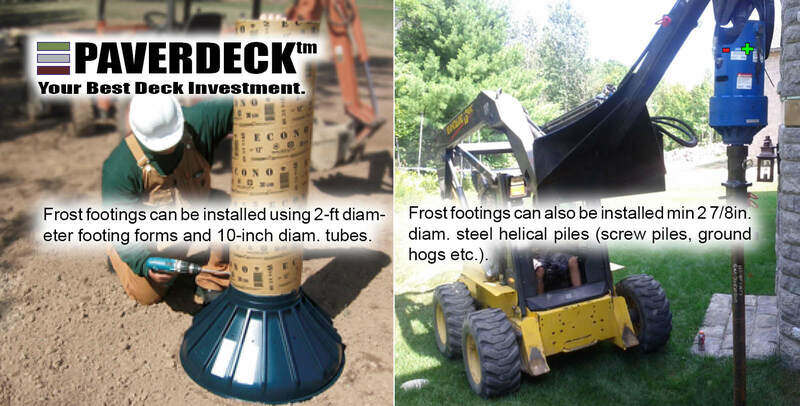 Also note TILEDECK™ can support concrete or stone pavers on properly sized footings/foundation. 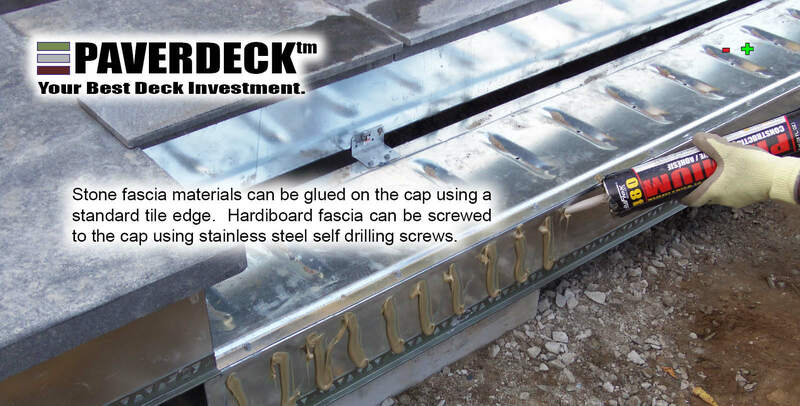 Because the TILEDECK™ completely covers and protects your treated wood structure, this system will greatly extend the life of your deck. 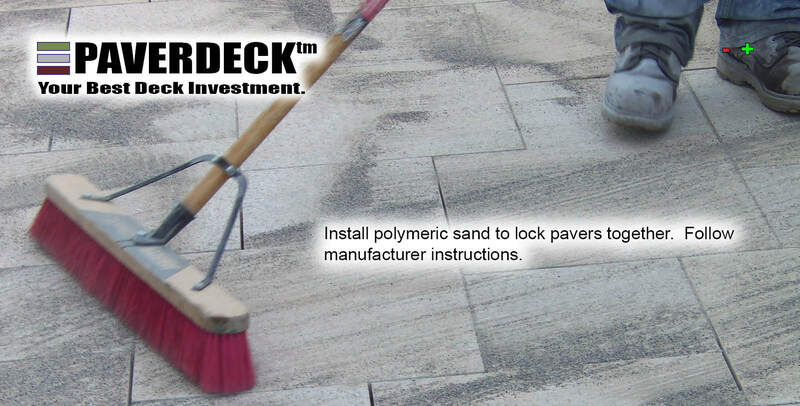 TILEDECK™ can be easily installed by homeowners or contractors. 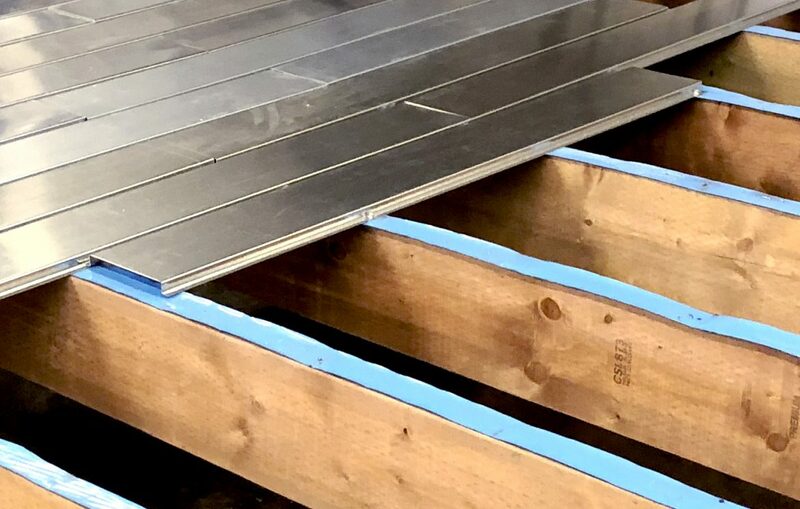 Tiles are not completely glued to the steel, which allows for water to pass through without damaging the tile, and allowing for simple replacement of a cracked tile. 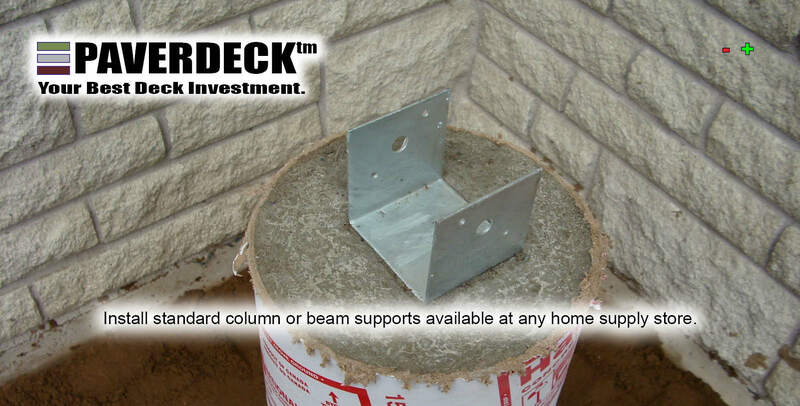 PAVERDECK™ galvanized steel panels can span 12-feet from beam to beam, which results in fewer columns and footings beneath. 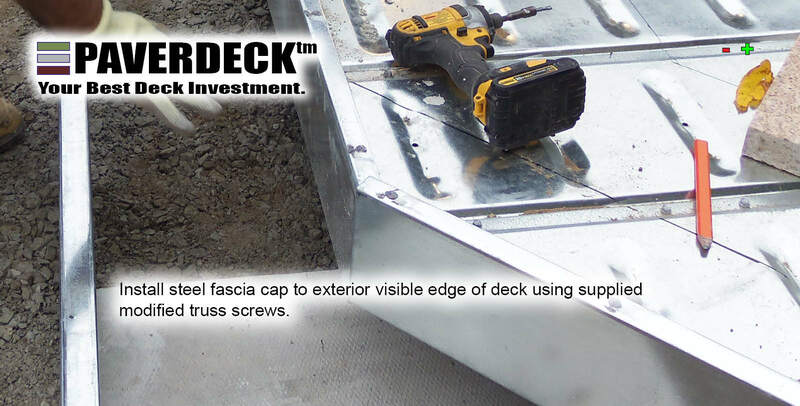 This is important for elevated decks where you want finished dry space underneath. A PAVERDECK™ is designed as a complete galvanized steel structure to support all loads – including the surface. The steel panels are the complete structure and require absolutely no maintenance to survive a lifetime. 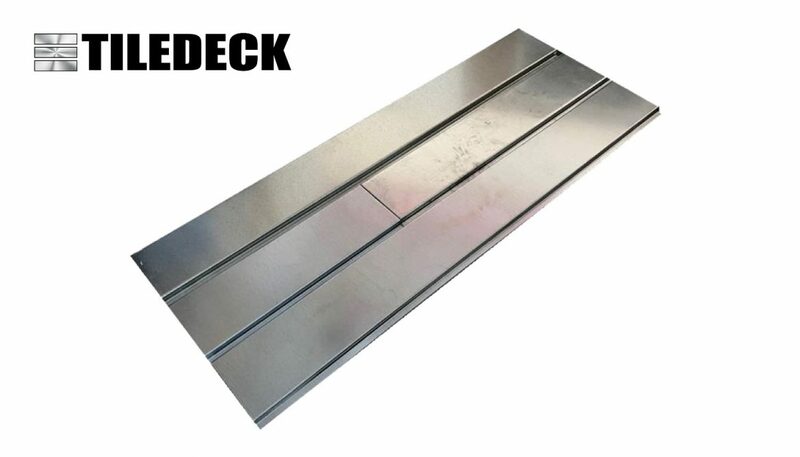 The surface finish is not part of the structure and is chosen based on deck design and budget. Natural stone pavers have no warranty, although most concrete pavers are sold with a lifetime replacement warranty. 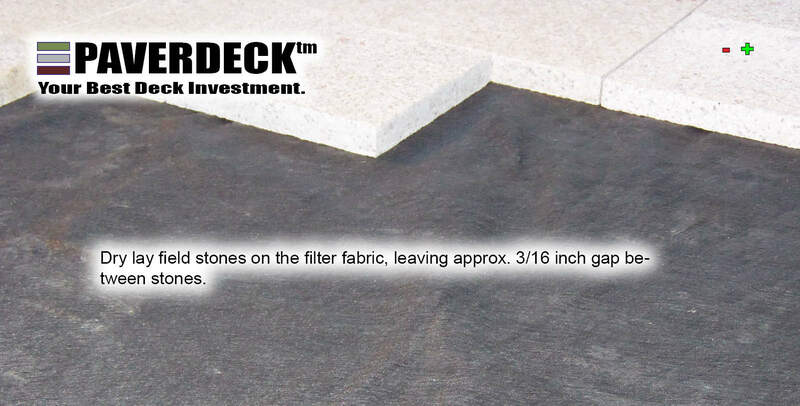 Pavers are dry-laid on top of a filter fabric. 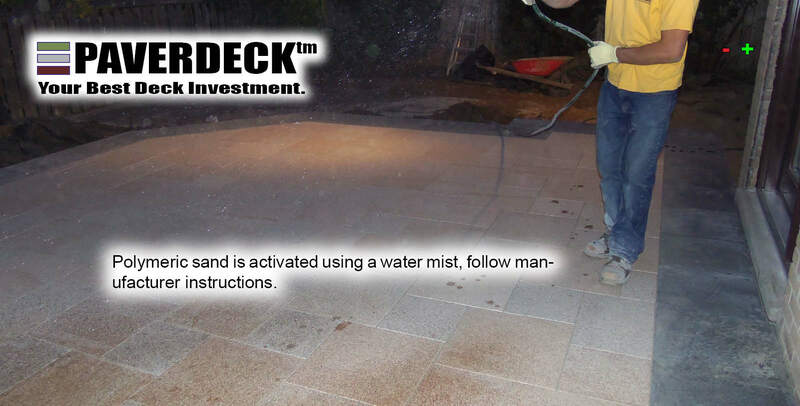 What happens if a paver cracks or becomes stained by accident – a field paver can be easily removed and replaced for little cost. Compare this with trying to replace a single composite deck board and trying to match the color. 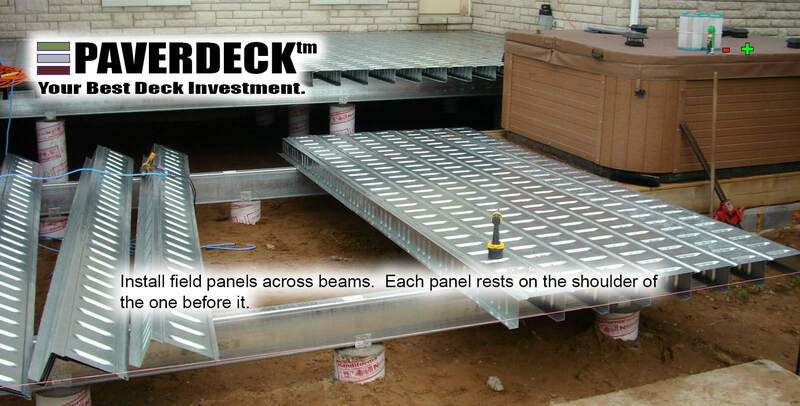 PAVERDECK™ galvanized steel panels were rated one of the best new products at DECKEXPO 2018 by Jordan Smith of The Build Show, representing the longest lasting maintenance free deck structure. Easy to Install. Simple installation for professionals and DIY handy people. we provide excellent design support and installation customer service. A Proven System. 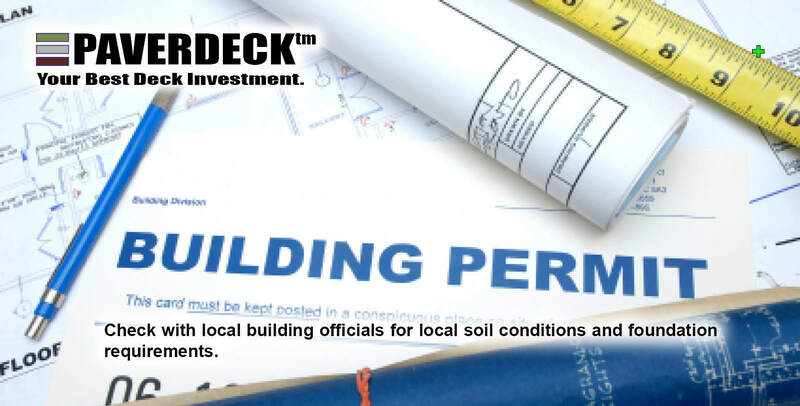 Ours is the only system certified code compliant by Underwriters Laboratories, rated for residential and commercial applications. 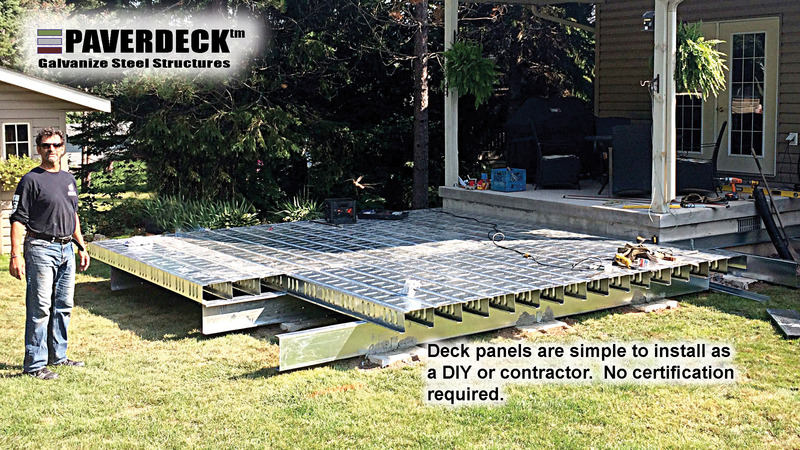 Its the longest lasting maintenance free decking system featured by Mike Holmes on a number of HGTV episodes, as well as Tamara Day on DIY Bargain Mansions. Affordable. 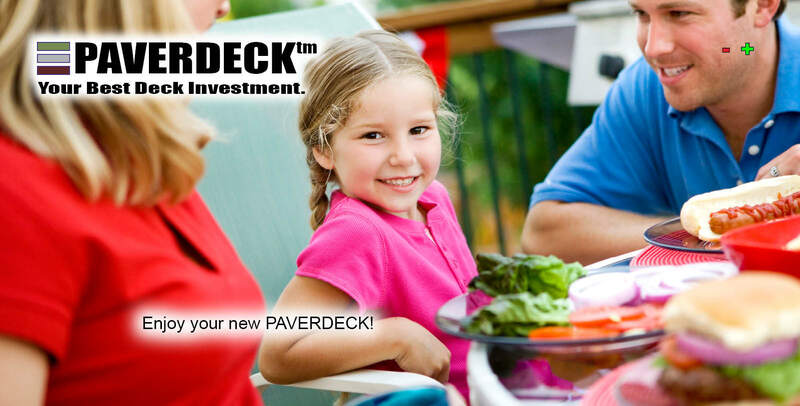 A PAVERDECK™ or TILEDECK™ structure is comparable to the cost of a cedar or composite deck. 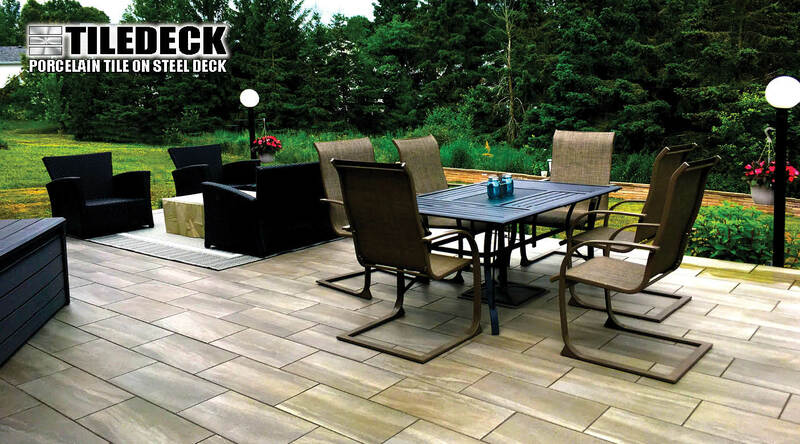 You can use surface options to fit any budget, and the lifespan of a PAVERDECK™ adds value to your home. Freedom from maintenance. A maintenance-free deck allows you to enjoy this time on other things. Resistant to fire and insects – is not susceptible to fire or rot – it will not allow the fire to burn or weaken the structure. Heated terraces. With PAVERDECK™ or TILEDECK™ it is easy and economical to integrate electric or hydronic snowmelt or underfloor heating. 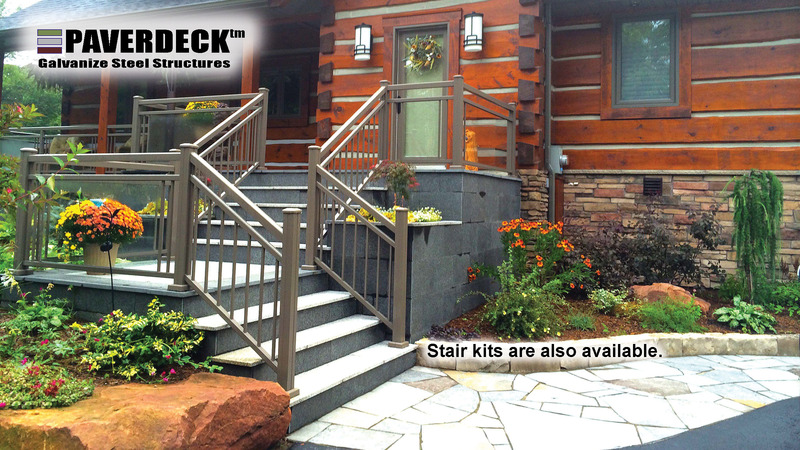 Perfect for stairs, and heated sunrooms. Certified. 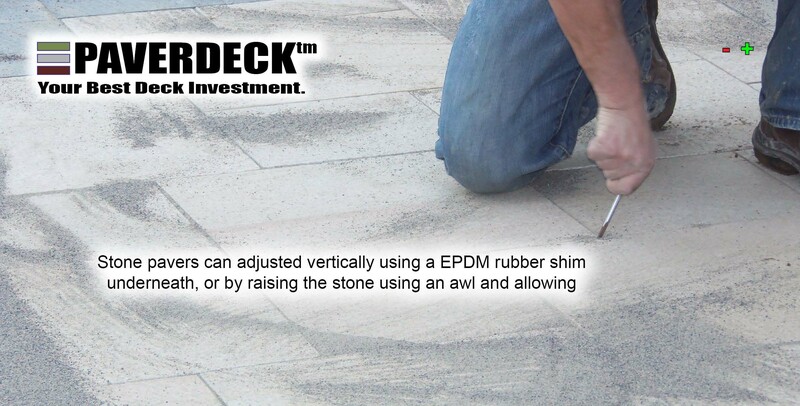 The PAVERDECK™ system is the only deck system certified code compliant by Underwriters Laboraties. Supported by the only 30-year residential structural guarantee. A North American sustainable solution. Our steel structures are manufactured in North America using certified materials with 95% recycled content. The long lifespan of our systems saves forests from depleting, and our materials will never see a land fill. Strong. With automotive unibody engineering, our patented structure is made from high strength galvanized steel. 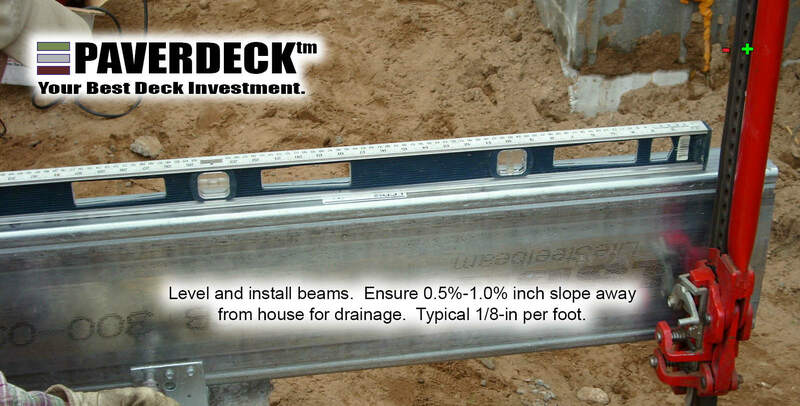 Stronger than any other deck system, the system withstood a load of 560 psf without collapse. Good for commercial and residential applications, and in hurricane prone areas. Unlimited design options. 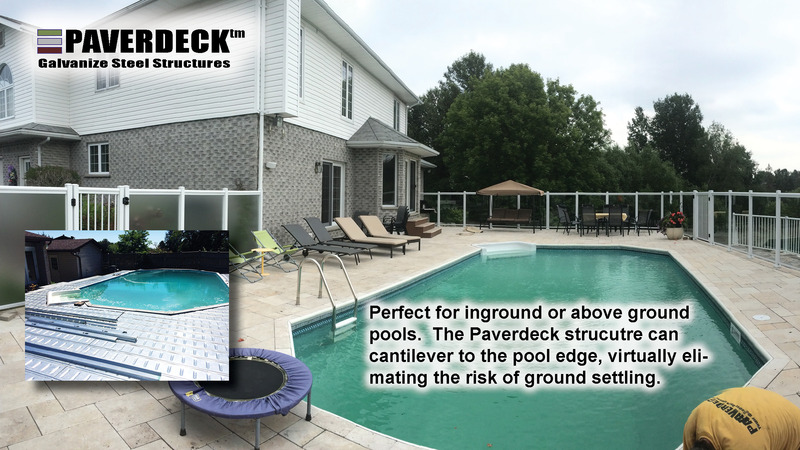 Design your space the way you want – A PAVERDECK™ or TILEDECK™ structure can be cut and shaped into any design and can be adapted to any finish with traditional or new materials – natural wood, stone / concrete pavers, porcelain or stone tile, poured concrete. The surface material is purely aesthetic, so you can mix and match materials in any pattern. 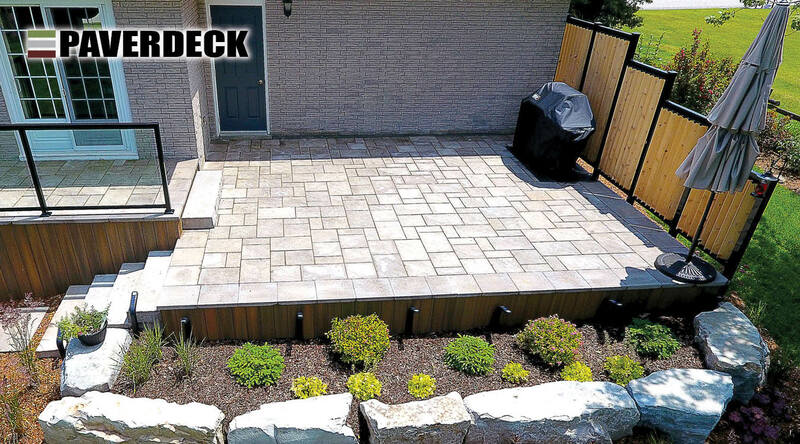 Paverdeck was recently featured in an article in DECKBUILDER MAGAZINE where Dan Watson of Superior Remodelling Solutions walks through a recent Paverdeck project. He describes Paverdeck this way . 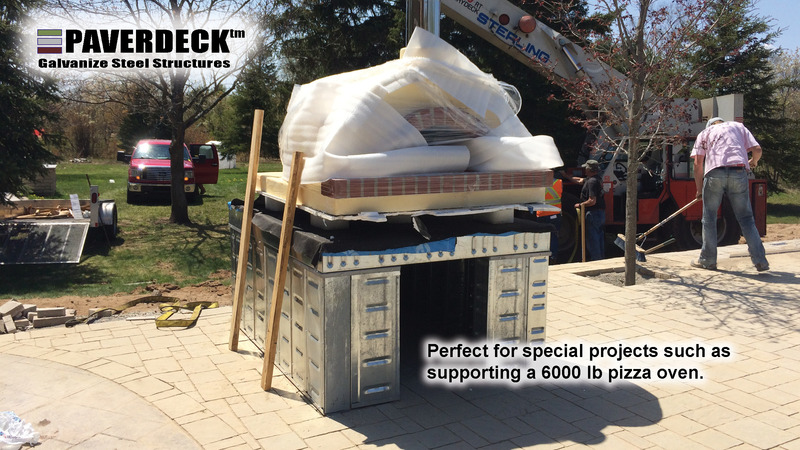 . . “Because we do a lot of steel framing, we already had all the specialized tools needed to install the Paverdeck panels. We found installation to be incredibly fast, even with just a carpenter and a laborer, since the deckpans and trim pieces just screw together and to the support beams with galvanized self-tapping hex-head sheet-metal screws.” In the end he produced an beautiful project as follows. 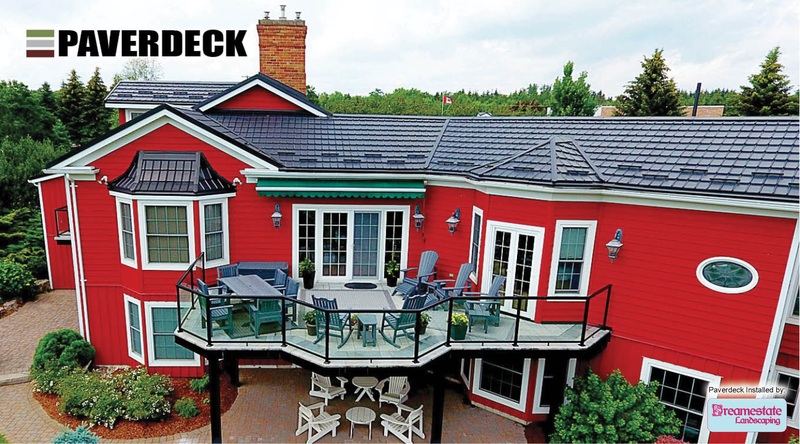 For consumers who want a maintenance-free lifetime deck solution, ours is a patented galvanized steel deck structure capable of supporting stone/concrete pavers or other finishes at any level – from ground level patios, elevated decks, rooftop terraces, docks, and other structures. 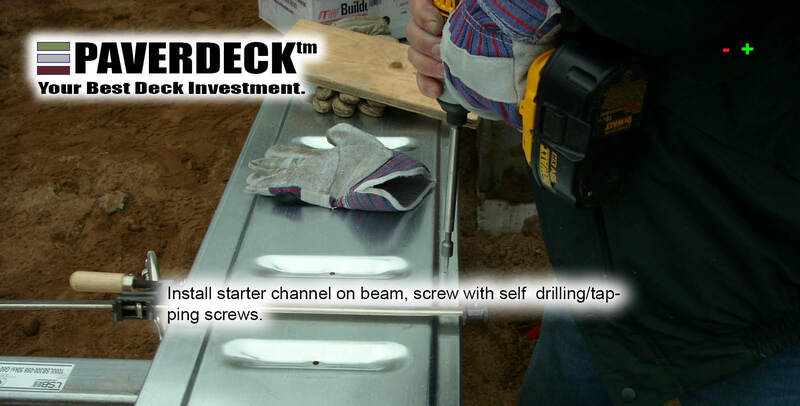 Simple to install for DIY and contractors. Available for both COMMERCIAL and RESIDENTIAL platform applications. Contact us to discuss your project ideas, if you don’t see your application listed. 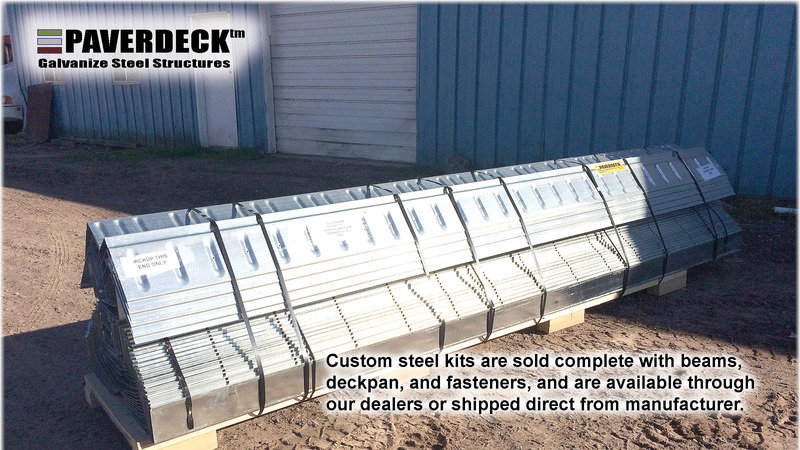 You can purchase the Paverdeck galvanized steel structure from authorized dealers in your area, or direct from the manufacturer (if a dealer isn’t available in your area). 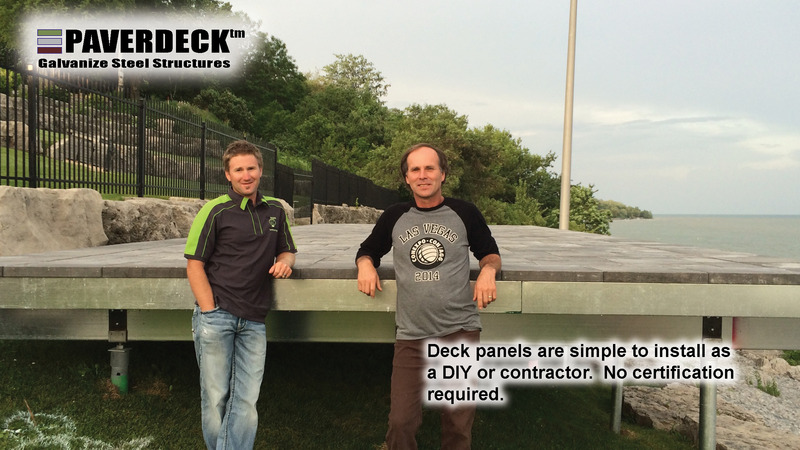 Getting a quote is simple, just email us your deck design, and we can provide you with a bill of materials quote delivered to your area. 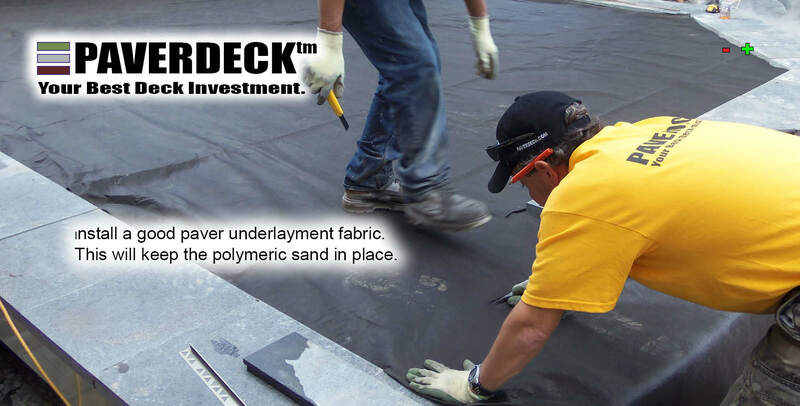 PAVERDECK is the only structure certified by Underwriters Laboratories, the most respected independent certification agency.